Summary: Learn about some of the rich features in SharePoint Online that are available to developers and designers. Read an overview of the feature sets and extensibility points for SharePoint Online, and gain an understanding of how to create solutions for this new environment. To download this guide in PDF or XPS format, see SharePoint Online for Office 365: Developer Guide. The Microsoft SharePoint Online Developer Guide is designed to help you gain knowledge and understanding of SharePoint Online within Microsoft Office 365 as you build and extend your online sites to meet your business needs. SharePoint Online provides a solid business collaboration platform on which developers can build solutions quickly by using familiar development tools. In addition to in-browser customizations, SharePoint Online supports development with Microsoft SharePoint Designer 2010, Microsoft Visual Studio 2010, and Microsoft Visual Studio Team Foundation Server 2010. SharePoint Online enables you to modify sites directly and deploy code as sandboxed solutions that are run in a protected environment to safeguard the environment from poorly performing or malicious code. SharePoint Online is a major step forward for business collaboration deployment options. At its core, SharePoint has a rich set of features accessible to developers of all skill levels. SharePoint Online takes this same developer tool set and ecosystem and moves it into the cloud within Office 365. This guide discusses some of the rich features in SharePoint Online that are available to developers and designers. It provides an overview of the feature set and extensibility points for SharePoint Online, and an understanding of how to create solutions for this new environment. This guide begins by describing the kinds of solutions that you can build, and then addresses the developer tools for SharePoint 2010, the new platform features, and the solution deployment architecture. SharePoint Online is a cloud-based service, hosted by Microsoft, for businesses of all sizes. Instead of installing and deploying Microsoft SharePoint Server 2010 on premises, any business can now simply subscribe to SharePoint Online to provide their employees with an enterprise-grade solution for creating sites to share documents and information with colleagues and customers. Moving your SharePoint infrastructure to the cloud does not change your ability to customize your environment so that it meets your business needs. Information workers, designers, and developers can modify the SharePoint Online environment by using many of the same tools and techniques that you would use for an on-premises deployment. SharePoint Online provides advantages to various people in your organization, including information workers, developers, and IT professionals. SharePoint Online offers a comprehensive set of functionalities spread across the different workloads, such as sites, social collaboration, search, content management, composites, and business insight. By using SharePoint Online, your users can be productive very quickly. SharePoint Online opens a new arena for developers to create solutions for customers who use the Office 365 service instead of maintaining on-premises servers, or for clients who want to take advantage of hybrid deployments where some data is stored behind the firewall and other data is off-loaded in the cloud. Sandboxed solutions, Microsoft Silverlight support, and the new client object model enable powerful custom solutions to be installed in SharePoint Online. SharePoint Online simplifies IT management by removing the need to deploy, configure, monitor, update, or upgrade a collaboration solution on your premises. You can use the Microsoft Online Services Administration Center to create new sites, install solutions, and provide access to specific users. SharePoint Online uses redundant and geographically dispersed data centers. Each data center houses a reliable and redundant infrastructure to support SharePoint Online. By allowing Microsoft to assume much of the operational burden that comes from managing the infrastructure that is associated with on-premises software, businesses can focus their resources on what is important—running their businesses. Small-sized businesses and medium-sized businesses can now take advantage of the same enterprise-grade technologies that are available to larger-sized companies, without having to shoulder the operational and hardware infrastructure necessary to host SharePoint on-premises. SharePoint Online includes many new capabilities and features for developers. The following tables summarize what is new for developer productivity and for rich platform features in SharePoint Online. SharePoint Designer 2010 enables you to quickly create SharePoint solutions in response to business needs by taking advantage of the building blocks that are available in SharePoint in an easy-to-use environment. For example, in SharePoint Designer, you can modify and brand the user interface, build workflows, define custom actions, and manipulate SharePoint lists and libraries. Visual Studio 2010 provides support for SharePoint development that you can use to build applications for your SharePoint Online environment. Support includes SharePoint project templates to help get your development started. Use Visual Studio 2010 to create SharePoint solution package (.wsp) files that enable you to deploy your solutions to your SharePoint Online environment. SharePoint 2010 can be installed on Windows 7 64-bit and Windows Vista 64-bit operating systems for development. This provides you with an opportunity to develop and test solutions for SharePoint Online without requiring that you deploy a server infrastructure on your development computer. 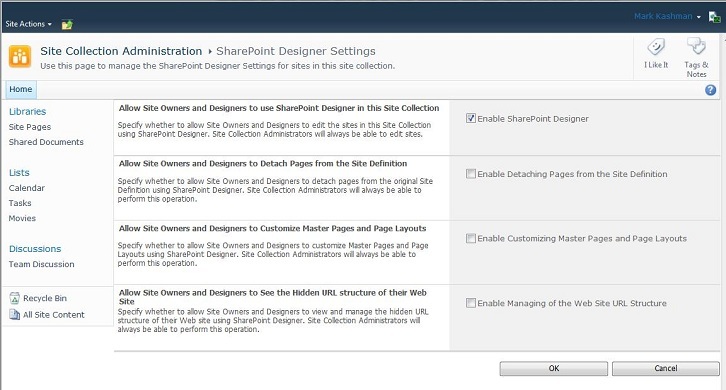 A sandboxed solution is deployed at the site collection level by using the SharePoint solution gallery, and it cannot access data outside the site collection in which it was deployed. In addition, a sandboxed solution cannot invoke certain security-related functionality, such as running with elevated privileges. All of these restrictions are put in place to ensure that malicious or poorly performing code cannot adversely affect the SharePoint Online environment. As a result, site collection administrators can feel confident about uploading and activating a sandboxed solution. SharePoint Online supports the deployment of sandboxed solutions that restricts the operations that your code can perform, and also provides a monitoring environment to verify that code does not adversely impact other sites. Developing a sandboxed solution is the only way you can upload and run custom code in SharePoint Online. The SharePoint Server ribbon provides a consistent user interface for working with SharePoint objects. The ribbon includes tabs and controls that appear at the top of the browser interface, providing a consistent location to perform tasks for users of your SharePoint site. SharePoint provides a dialog box platform that enables modal dialog boxes to be included in custom solutions that fit in with the style of a SharePoint page. By using dialog boxes, users are encouraged to focus on the information that is presented to them, and then interact with and close the dialog box before continuing to work with the site. Dialog boxes enable developers to create responsive user interfaces; for example, users can complete data entry boxes from the pop-up dialog box on the existing page instead of having to move to a new page to complete the data entry task. In many cases, they improve performance by reducing the number of page requests and round trips to the server. SharePoint 2010 provides a Microsoft Silverlight Web Part that you can use to easily add a Silverlight application to a page in your site. You can upload a Silverlight application to a library in your SharePoint site and then configure the Silverlight Web Part to load your Silverlight application. SharePoint 2010 enables you to create relationships between lists in your SharePoint site collection. For example, you can specify that the column for a list can take values that exist only in another list elsewhere on the site. By using a defined lookup, you can use join statements in Collaborative Application Markup Language (CAML) or LINQ to SharePoint to query across lists. SharePoint 2010 includes the LINQ to SharePoint provider, which translates LINQ statements to CAML queries. LINQ is a standard query language and, when applied to SharePoint, it enables developers to query SharePoint lists without requiring them to learn the Collaborative Application Markup Language (CAML) syntax that is used internally by SharePoint. SharePoint 2010 provides new events that you can use when you develop applications for your SharePoint site. Events enable you to intercept an action and run code either pre-event or post-event, as part of a sandboxed solution. In SharePoint 2010, you can associate workflows with the site and with a particular list. This enables you to create workflows that affect multiple lists or start workflows that do not affect lists. Workflows also support new events that enable complex business processes to be chained together in a modular, manageable way. You can develop code for workflow events only in sandboxed solutions. The client object model is a client-side set of technologies that exposes SharePoint 2010 server-side objects and data on client computers. By using the client object model, you can develop applications that run on the client computer through familiar development concepts, such as objects, properties, events, and methods. SharePoint 2010 provides access to server data through the Representational State Transfer (REST) API. By using REST, lists and list items are represented as HTTP resources that can be addressed by remote URLs. SharePoint Online provides many of the features that you expect from SharePoint 2010, such as document sharing, collaboration, and workflows. In addition, you can use SharePoint Designer 2010 to design and modify your site’s appearance and core collaboration functionality. You can also use Visual Studio 2010 to develop powerful custom solutions for the SharePoint Online environment. You can use the customization capabilities of SharePoint Online to build business solutions that match your specific requirements. The following table lists some of the types of customization options available to you, and describes the patterns and tools that you can use to implement those types of customizations. Use SharePoint Designer to create and deploy no-code workflows. Use SharePoint Designer to customize content types. Use SharePoint Designer to brand master pages. Use SharePoint Designer to create page layouts. Use SharePoint Designer to create and deploy site templates. Use the Data View Web Part to create mashups, filtered views, rollups, and general renderings of SharePoint data or data consumed from web services or RSS feeds. Use Microsoft InfoPath 2010 to design browser-based forms for lists and workflows. Use the SharePoint web services to access and manipulate data from HTTP requests without writing code for that manipulation. Use Visual Studio 2010 to create code-based sandboxed solutions that can be deployed to SharePoint Online environments. You cannot deploy pluggable authentication providers, site definitions, or other features and solutions that require deployment and configuration on the server at the farm level. You cannot modify built-in SharePoint files, web.config settings, or security policies. You cannot make configuration changes that affect the web server settings or the Microsoft .NET Framework. You cannot make changes or add capabilities that require a custom database, or that require changes to an existing database. You cannot make changes to the underlying Windows Server and Microsoft SQL Server platform layers. SharePoint Online provides support for developing your business applications. Most development projects for SharePoint can be categorized into one of four major project types. The following describe these types and their key features. Changes and customizations (such as branding, creating and manipulating lists, and setting site properties) are often performed on live SharePoint Online sites by using the web browser or SharePoint Designer 2010. Additionally, saving a modified site as a template by using these same tools is a common development task. This template is often used as the starting point for further development in Visual Studio. Single Web Part solutions can range from a simple Web Part that renders data from a SharePoint list in a specific way, to a complex solution that displays data from several sources and wraps additional functionality around that data. You can build Web Parts by using Visual Studio 2010. Collaborative business solutions are designed to facilitate and encourage users to work together toward a common goal. These types of solutions typically include multiple SharePoint features, such as lists, forms, workflows and event receivers that can be combined to implement a collaborative solution. For example, you could build a collaborative solution that manages the recruitment process for an organization by combining standard SharePoint features. You can build collaborative solutions by using the browser, SharePoint Designer 2010, or Visual Studio 2010. The approach that you use depends on the complexity of the solution that you are building. SharePoint offers six workloads that you can customize by using well-defined extensibility points. The following table briefly describes the workloads. SharePoint Sites provide a single infrastructure for all your business websites. You can share lists and documents with colleagues and partners, or publish information to customers. The Sites workload provides security features and management that enables you to help secure your content and ensure it is targeted to the appropriate users. Sites also support mobile devices and enable users to work with content offline. SharePoint Communities use SharePoint Online as a single management platform to deliver various collaboration tools (such as blogs, wikis and people search). Communities provide your users with opportunities to share ideas, find colleagues, and create social content. The Communities workload includes tagging, rating, and the tag cloud, which can all encourage a sense of community among your users. SharePoint Composites offer tools and components for you to build your solution by selecting from existing features without requiring you to write code. Make use of built-in features to assemble powerful business solutions. Use the built-in workflows to create approval and review workflows in SharePoint Designer or in Microsoft Visio. SharePoint Content workloads simplify content management with features such as document types, retention policies, and tight integration with Microsoft Office and SharePoint Enterprise Search. Use features such as page layouts to add variety to your SharePoint deployment, and meet compliance needs with strict document retention capabilities. SharePoint Insights give users access to data that is stored in business applications through dashboards and scorecards, so they can make decisions based on that data. By using Excel Services, you can easily provide access to Microsoft Excel workbooks stored in SharePoint Online. SharePoint Search workloads provide discoverability for documents, list data, and people. There are several general approaches to customizing or extending these core SharePoint workloads. Customize the workloads by using the browser, SharePoint Designer 2010, or Visual Studio 2010. The approach that you use will depend on the complexity of the solution that you are building. You can use various tools to build solutions targeted at SharePoint Online. Tools include the browser, SharePoint Designer 2010, and Visual Studio 2010. In addition, SharePoint provides a .wsp file packaging format for SharePoint solutions that enables you to share solutions between tools such as SharePoint Designer 2010 and Visual Studio 2010. This common packaging format simplifies the transition between the tools and enables collaboration among users who have different skills. For example, a solution that is designed in SharePoint Designer 2010 by a site designer can be easily packaged and provided to a developer in the standard .wsp format as a starting point for more development in Visual Studio 2010. The following table summarizes the tools for building solutions for SharePoint Online that are available to developers. Later sections in this developer guide describe how to use the tools in this table to create solutions and customizations for SharePoint Online. SharePoint 2010 provides options for you to customize the SharePoint site by using functionality available through the SharePoint browser interface. You can easily switch pages into edit mode and then add or remove Web Parts, content, and images in the user interface. By using the browser, you can also make other changes to your SharePoint site, such as adding or configuring lists, content types, or workflows, and changing the configuration of the site from the Site Settings page. You can also use the browser to change the theme of the site. By selecting a theme, you can change the appearance of all pages in your site from one place. SharePoint Designer 2010 is an important tool in the solution creation life cycle for SharePoint Online. You can create and configure sites by using SharePoint Designer 2010 and you can package them into a SharePoint solution (.wsp) file that can be exported for more modification by Visual Studio 2010. SharePoint Designer 2010 has been designed around the artifacts that you create in SharePoint, such as lists and libraries, workflows, content types, data sources, site level settings, master pages, and page layouts. Visual Studio 2010 includes support for the most common types of projects that you might want to build with SharePoint Online. You should be aware that Visual Studio supports two forms of SharePoint 2010 solutions: farm and sandboxed. Farm solutions are registered in the global assembly cache and run under full trust. Farm solutions are not supported by SharePoint Online. Sandboxed solutions are deployed to the site collections solution gallery and run in a restricted execution environment. Sandboxed solutions are supported in SharePoint Online. By creating sandboxed solutions in Visual Studio 2010, you can extend the capabilities of your SharePoint Online solution. A number of project templates for creating SharePoint items are provided with Visual Studio, and these templates are available in either Microsoft Visual C# or Microsoft Visual Basic. This section drills down into how to customize SharePoint Online sites by using a browser. Using the browser to make customizations is appropriate when you are making ad-hoc changes to your solution, or when you are creating objects that will be used as part of a site template. You can create lists and libraries in your SharePoint Online site by using the browser. When you create a SharePoint list, you can select an existing list template or you can create a custom list that starts with a basic template. After you create the list, you can add or remove columns so that it meets the needs of your application. By using the browser to create your lists and libraries, you can more rapidly respond to the ad-hoc storage requirements of your organization. You can also specify lookup columns to display data from existing lists in your new list. For example, you can create a list of office locations and use links to that list from other lists that you create in your solution. As with lists, when you create a new library for your SharePoint site, you can specify an existing template on which to base the new library. For example, you can create a basic document storage library, or you can create a library to store pictures, slides, forms and other content. Lists and libraries automatically generate their own user interfaces, such as Web Parts, forms, and dialog boxes for working with the files and list data. However, if your requirements include creating custom interface components or workflows for specific lists or libraries, it may be more appropriate to create the lists and libraries in a package and deploy them with the other components from Visual Studio 2010. Packaging and deploying lists and libraries with other components is discussed later in this Developer Guide. A content type is a reusable collection of columns, workflows, behaviors and other settings for a category of items or documents in your SharePoint Online site. For example, you can create a content type that represents an expense request and include the information that must be captured and a workflow that must be followed when an individual creates a new expense item. You can create new content types by using the browser by accessing the Site Settings page from the Site Actions menu, and then selecting Site content types in the Galleries section. You can modify the new content type by adding columns to it and by specifying other properties that define how information that is associated with this content type will be managed. The creation of a new content type is often associated with other activities, such as adding corresponding workflows, lists, or libraries that use the content type you have defined. Each of these tasks can also be performed by using the browser. However, more complex requirements are often defined and deployed together as a SharePoint Feature. To define a SharePoint Feature, you should use Visual Studio 2010. The browser provides an easy-to-use interface for creating new pages in your site. By using the ribbon or the Site Actions menu, you can switch to edit mode and use the in-place editing features of SharePoint Online to customize pages so that they meet your requirements. The ribbon provides a rich editing interface and the option to change your page layout and add new content, such as text, images, and Web Parts. You can also create pages by using the browser and export those pages as part of solution packages for inclusion in projects that require additional development. For more information about how to create site pages by using the browser, see Web Authoring in SharePoint 2010. Site templates provide a starting point for you to create a site with a preconfigured structure, features, and content. You can use the browser to easily create a new site from a template, and you can create a new template in the browser by saving an existing site as a template from the Site Settings page. When you save your current site as a template, you can specify the file name, template name, and description, and you can choose to include the current site content in the template file. Newly created templates are located in the solution gallery and appear on the new site dialog box when you choose to create a new site. You can export site templates that you create by clicking the corresponding .wsp file in the solution gallery. You can then modify them further by using Visual Studio 2010. You can use the browser to create subsites in your site collection by clicking New Site on the Site Actions menu. You can select site templates from the list of site templates that appears. You can specify the name and address for the subsite and choose to use the same permissions that are set for the parent site, or you can define unique permissions for the subsite. The browser provides an easy way to modify the properties of your site, and you can change settings and view those changes immediately. To modify the site's properties, on the Site Settings page, select the options you want to change from the corresponding category. For example, you can change the basic properties of the site, such as the title, description and icon, and you can also configure the menu settings and add your own menu items to the SharePoint interface. SharePoint provides a flexible layout system for pages that you create on your site. For example, you can specify that the page content is split into several columns with optional headers, footers, and sidebars to get a page layout that is suitable for your application. You can use the browser to pick a layout for a page by selecting edit mode and then choosing a text layout from a list of options. Using the browser is appropriate if the layout that you require is supported by the built-in layouts. If that is not the case, you may have to use SharePoint Designer to create the page layout that you want. Adding the Content Editor Web Part to your page enables you to control the content of the page, and lets you add HTML content and CSS styling from the browser. This is an appropriate approach for changes to specific pages on your site. All elements that share a given CSS class. Those that have certain attributes. Those that appear in a given position in the document. Those that have a relationship to other elements. More importantly, you can add filter conditions and you can chain all these query features together to meet your specific requirements. To integrate jQuery into SharePoint Online, you can upload the API into a document library, and then add a Content Editor Web Part that references and uses that API in your SharePoint Online sites. This section examines in detail using SharePoint Designer 2010 to customize SharePoint Online sites. Using the browser to make customizations is appropriate when you are making ad-hoc changes to your solution or when you are creating objects that will be used as part of a site template. SharePoint Designer 2010 is an ideal choice for rapid development of SharePoint applications for advanced users, site designers, and developers. By using SharePoint Designer 2010, you can construct no-code solutions from the building blocks available in SharePoint 2010. In addition, you can use SharePoint Designer to get a quick start on your SharePoint development projects. The ability to modify your SharePoint Online site by using SharePoint Designer 2010 should be restricted to particular users, and SharePoint Online provides the site collection administrator with the option to enable or disable various SharePoint Designer features. These settings are configured from the SharePoint Designer Settings page that is available from the Site Settings page. The following figure shows the available options. For more information about getting started with SharePoint Designer, see Customizing SharePoint Online Using SharePoint Designer 2010. SharePoint Designer 2010 makes it easy to change the theme and branding of your SharePoint site. By using SharePoint Designer 2010 to modify your site, you can incorporate changes that are not available to you through the Site Settings page in the SharePoint browser interface. By using SharePoint Designer 2010, you can add a company logo, select a color scheme, and modify the headers and footers for your SharePoint Online site collection. This branding is then inherited by the site collection's subsites. When you select Change site theme in SharePoint Designer 2010 you are directed to the Site Theme page on the SharePoint site, where you can change the theme by using the browser. Master pages are a Microsoft ASP.NET feature that is used in SharePoint 2010 to specify a consistent design of the site. This consistent design is inherited by content pages that use the master pages. Master pages make development of your site much easier because when you create a new content page based on a master page, you do not have to repeat the markup that you defined in the master page. When a content page is rendered, the content page is merged with the master page to provide the output that is presented to users. A master page is an ASP.NET file that has the extension .master and that has a predefined layout of HTML elements and controls. The master page has a specific directive that identifies the page as a master page and it also includes the basic HTML structure for your pages. For example, you can include a logo and menu structure on your master page, and a footer that you want to appear on all of the pages in your site. The master page uses content placeholders to specify the location in which to display content on the page, and an identifier that is used to reference the location when a content page is loaded. You can edit a master page from your SharePoint site by using SharePoint Designer 2010 to open and edit the page. You can also create new master pages by using SharePoint Designer, but a master page that you create using this approach will not have all of the content placeholders that SharePoint 2010 requires to function correctly. However, you can add the required placeholders to your page manually, or you can copy the contents of an existing starter master page to help get you begin. Page layouts are an important feature in SharePoint publishing sites that define how a page should look, and the content that should be present on the page (such as lists and libraries). You can edit page layouts in SharePoint Designer 2010 by selecting the page that you want to edit from the page layouts object collection in the SharePoint Designer navigation folder. After you open a page layout for editing in SharePoint Designer 2010, you can edit it just as you would edit any other page that is attached to a master page. When you add custom content to a page layout, the content appears on all the publishing pages that are based on that page layout. Tables Create tables to align content. Pictures Click and drag images from the Images folder to a section of the page. Links Insert hyperlinks or bookmarks. Data views and forms Insert a Data View Web Part or a form. Controls Insert HTML controls, ASP.NET controls, SharePoint controls, or Data Source controls. Web Parts Insert a Web Part and give visitors to the page the option to add or remove Web Parts (such as views of document libraries and lists). Symbols Insert symbols that are not available from your keyboard. SharePoint Designer provides an ideal interface for you to work with the cascading style sheets in your site. When you edit the style sheet on the master page, your changes are applied to all of the child pages that use the master page. Before editing the cascading style sheets in your site, you should consider making a copy of the master page. When you are using SharePoint Online, you will not have access to the underlying folder location to upload or modify the cascading style sheets that are provided with SharePoint 2010. Therefore, you should make your changes to a new style sheet and upload that new style sheet to a library on the server. You can then reference the new style sheet from the master page. For more information about how to work with cascading style sheets in SharePoint Designer, see Working with the SharePoint Theming Engine. You can design workflows for your SharePoint deployment by using the graphical modeling interface, or workflow designer, that is available in SharePoint Designer 2010. The Workflow Designer enables you to specify a set of steps, conditions, and actions that fit together into a workflow without requiring you to write code. Workflows can also be designed in Visio 2010 and imported into SharePoint Designer 2010. List workflows Using this mechanism, you attach the workflow directly to a list or library on the site. Use the List workflow when you are making a workflow that is specific to a list or library and does not have to be deployed for use on a different list or library. Reusable workflows This type of workflow is created with reusability in mind. Create a reusable workflow when you intend to attach it to a content type and use that content type in a list or library. Site workflow Site workflows are not attached to a list or library. They work on the site itself. Use this workflow if you do not want to restrict the automated process to a list or library on the site. For example, you can use the site workflow to take a survey of the site members or to execute a process on a Document Set. You do not need to create all workflows from scratch. The built-in workflow templates (Approval, Collect Feedback, and Collect Signatures) that can be used in the browser can also be extended by using the Workflow Designer. These workflows are categorized as Globally Reusable Workflows and are visible and available to every site in the site collection. In addition to creating workflows with SharePoint Designer 2010, you can also develop and deploy powerful workflow artifacts, such as custom workflow actions and server-side workflow event handlers. You do this by including them in Visual Studio-based sandboxed solutions. For more information about how to develop sandboxed solutions, see Building, Testing and Deploying Sandboxed Solutions in SharePoint Online by Using Visual Studio 2010 later in this Developer Guide. In SharePoint Designer 2010, you can create list views and data views and list forms and data forms. You create such views and forms to help site visitors interact with the data on the site, and in the case of a custom solution, to manage how data is presented and modified. Every view and form you create in SharePoint Designer 2010 is stored in a Web Part. The Web Part contains the code needed to render the view or form on the page and enable users to change the appearance of the data or manipulate data in the list. Depending on which view or form you choose and the type of data source you are using, a different Web Part is added to the ASPX page. Some of the Web Parts are editable in SharePoint Designer 2010, some in the browser, and some require related SharePoint tools such as InfoPath 2010. The following table briefly describes the various Web Parts that are used for the views and forms you create in SharePoint Designer 2010. The standard and often default view associated with lists and libraries. This Web Part is also used when you create a view on a page where the data source is a list or library. This Web Part has full ribbon support in SharePoint, so the view can be customized in the browser or in SharePoint Designer. Used by default when you create a data view to a data source other than a list and library. You can use the Data Form Web Part for lists and libraries when the Data Source Details pane is used, and it can be used as a view or a form to any data source, including lists, libraries, and web services. Used in the previous releases of SharePoint, and is used only in certain upgrade scenarios in SharePoint 2010. It is unlikely that you will use this Web Part in your SharePoint Online solutions. The default list form used for SharePoint lists and libraries. This Web Part provides a well-formatted, easy-to-use form for users. To customize the form, however, you must replace it with a Data Form Web Part or upsize the forms to Microsoft InfoPath. Used for highly specialized views, like the Calendar view, Gantt view, and Datasheet view. The Web Part is well-formatted and provides powerful views of the list or library. To customize the views shown in the Web Part, you can use the SharePoint Designer code view. Used to host InfoPath-based list forms. The Web Part is created when you customize list forms in InfoPath 2010. It is highly customizable and renders powerful forms generated by InfoPath 2010 form templates. This Web Part cannot be customized directly in SharePoint Designer, but the integration between SharePoint Designer and InfoPath 2010 enables you to launch the InfoPath 2010 editor from the SharePoint Designer 2010 environment. Sandboxed solutions are a new feature of SharePoint 2010. Sandboxed solutions provide many benefits for information workers, site administrators, farm administrators, and the SharePoint Online environment. As a developer, you can use Visual Studio 2010 to create sandboxed solutions. You typically create sandboxed solutions when you need to do the following. Deploy a solution that contains functionality (such as server-side code) that cannot be achieved by using SharePoint Designer 2010 or the browser. Create a reusable deployment package that will be installed in multiple SharePoint Online sites. Create an ISV solution for your customers who use SharePoint Online. Sandboxed solutions are those solutions that are uploaded by administrators to the solution gallery in a SharePoint site collection. In a SharePoint Online environment, it is essential that sandboxed solutions do not have unwanted effects on other site collections, and that they can be monitored and managed easily. The benefits of sandboxed solutions include the following. Rapid configuration Site collection administrators can deploy and manage sandboxed solutions so that farm administrators do not need to assess, deploy, and manage all the functionality that is required by information workers. Flexibility Sandboxed solutions are run in a separate process that can be restricted by quotas, and their effect on the farm can be monitored. Stability Sandboxed solutions can be added to SharePoint sites without the risk of affecting processes outside the sandbox. When you create a new SharePoint project by using Visual Studio 2010, the SharePoint Customization wizard prompts you to choose a Farm Solution or a Sandboxed Solution. If you choose Farm Solution, and need to change the type to a Sandboxed Solution after you create it, you can set the Sandboxed property to true. Currently, you cannot deploy solutions directly from Visual Studio to SharePoint Online. Furthermore, you cannot currently attach the Visual Studio 2010 debugger to solutions that are deployed in SharePoint Online. Therefore, you must set up a local development and test environment before you start to create sandboxed solutions for SharePoint Online. Your goal in creating development and test environments should be to mirror the SharePoint Online environment as closely as possible. For example, you should include SharePoint Foundation 2010 in your local environment, and you should ensure the user code services are running so you can deploy and test sandboxed solutions. For more information about how to set up your development and test environments, refer to Setting Up Your Local Environment for SharePoint Online Solution Development later in this Developer Guide. In addition to setting up your local environment to mirror the SharePoint Online environment as closely as possible, you can also create site collections in SharePoint Online that mirror your production site collections but that are not used by your information workers. This approach enables you to perform final tests and verifications for your solutions before you deploy them to the production site collections. This approach also enables you to output debug information from your solutions in a real SharePoint Online environment, as described in the section Outputting Debug Information in SharePoint Online, later in this guide. The Visual Studio 2010 SharePoint Power Tools include many features that make your development process easier and enable you to concentrate on fulfilling your business requirements. Additionally, the Visual Studio 2010 SharePoint Power Tools are sandbox-aware, and provide you with compile-time checking to ensure you use namespaces and classes that are supported only in sandboxed solutions. Furthermore, the Visual Studio 2010 SharePoint Power Tools enable you to deploy artifacts in sandboxed solutions that would otherwise be disallowed. For example, you can create and package sandboxed versions of Visual Web Parts by using the Visual Studio 2010 SharePoint Power Tools, which otherwise would be disallowed. For more information, see the section, Restrictions for Sandboxed Solutions, later in this guide. You can download the Visual Studio 2010 SharePoint Power Tools. If you do use restricted namespaces and object types, the build process will still succeed. This is because compilation is performed by Visual Studio against the full object model, regardless of whether the solution is sandboxed. However, when you attempt to deploy a sandboxed solution to SharePoint Online by uploading it and activating it in the solution gallery, SharePoint Online validates the contents of the solution package (.wsp file) and does not deploy it if it contains prohibited artifacts. After you test and debug your sandboxed solutions, you can use Visual Studio to package them into .wsp files, just as you do for farm solutions. The key difference, however, is that site collection administrators can then simply upload the solution package to the solution gallery and then activate it, instead of requiring farm administrators to deploy the solution. As previously discussed, you cannot attach the Visual Studio debugger to SharePoint Online server-side processes. So you must debug your solutions in your local development and test environments. When you press F5 (or use the equivalent menu or toolbar commands) in a sandboxed solution, Visual Studio deploys the solution to the solution gallery in your local SharePoint site collection, and automatically attaches to the SPUCWorkerProcess.exe process. This means that breakpoints, watches, stepping through code, and other debugging features will work for your solution. If you want to debug a solution that is already deployed in your local development or test environment, you can retract, and then redeploy the solution as described previously, or you can attach the debugger to the SPUCWorkerProcess.exe process manually. When you have debugged your solutions in your local development or test environment, you should further test that they run as expected in SharePoint Online by uploading and activating them in your test site collections. You can further validate the operations being performed in the actual SharePoint Online environment by conditionally creating list items in SharePoint lists, based on any information that you want to interrogate at run time. In effect, you can use SharePoint lists as a custom application log that can help you analyze the operations, exceptions, and performance of your solutions. If you take this approach, you should consider the implications of creating a large number of list items on your SharePoint Online storage quotas. For example, a good pattern is to conditionally create list items for your data only in the DEBUG configuration of your solution, and to deploy the DEBUG build only to your test site collections. Then, when you are satisfied that your solution is functioning correctly, you can deploy the RELEASE configuration to your production site collections, and you will not use storage quotas needlessly in that environment. To ensure stability for the rest of the farm, some artifacts and operations are not allowed in sandboxed solutions. Not all types of Visual Studio projects for SharePoint can be configured as sandboxed solutions, regardless of the code operations that they perform. In general, project types that affect only one site and that do not deploy files to the SharePoint file system are allowed. Additionally, access to SharePoint data in a sandboxed solution is restricted to the site collection in which the solution is activated and running. As an example, it is prohibited to instantiate an SPSite object with a remote SharePoint URL as its constructor. As another example, it is prohibited to use the Create method of the HTTPWebRequest class to create a connection to other external websites. Access to non-SharePoint databases is also prohibited in sandboxed solutions. You cannot include BDC models in your sandboxed solutions, and you cannot create SQL Server connections. Most objects and operations that affect only the site in which a sandboxed solution is running are generally allowed. For example, your code in a sandboxed solution can access lists, respond to events, create libraries, and render data in Web Parts. However, certain operations at the site level, such as performing these tasks with elevated privileges, are prohibited. Objects that have a larger scope than the current site cannot be used in sandboxed solutions. For example, you cannot work with SPFarm objects or SPService objects in your sandboxed solutions. For a full list of allowed objects and operations, see Microsoft.SharePoint.dll APIs That Are Available from Sandboxed Solutions. If you attempt to perform a prohibited operation in a sandboxed solution, exceptions are raised by the SPUCWorkerProcess.exe process. Some of these exceptions can be caught and handled by your code, whereas others are handled by the sandboxed environment before your exception-handling code is invoked. With the SharePoint 2010 client object model, you can connect to and manipulate SharePoint objects and data from applications that run remotely from servers running SharePoint. Now, however, SharePoint 2010 provides a client object model that is as easy to use as the server-side object model is, and it supports many more operations and features than do the traditional web services. You can, of course, still use the web services if they meet your business and technical requirements. In this section, you will learn about the SharePoint 2010 client object model, and you will also learn about the support for the traditional web services in SharePoint Online solutions. The SharePoint 2010 client object model is a client-side set of technologies that exposes site-level data and objects on client computers. The server-side data platform exposes farm settings, sites and webs, native list data, and external list data to server-side applications. The SharePoint 2010 client object model lets you access a subset of this functionality, such as sites and webs, and native list data on client computers. The SharePoint 2010 client object model gives you familiar concepts, such as objects, properties, events, type enumerations, and methods that you can use to develop SharePoint solutions. For example, the SharePoint 2010 client object model provides Web objects, Site objects, and List objects, and you can work with these objects in a very similar way to how you develop solutions by using the server-side object model. However, when you create and manipulate objects, set properties, and call methods of the SharePoint 2010 client object model, those commands are batched on the client and are not executed immediately on the server. Instead, they are batched and formatted as XML description of the operations to perform. Then, when you call the ExecuteQuery method or ExecuteQueryAsync method, the commands are sent as an XML packet to the client.svc service on a SharePoint web server. With these DLLs, you can develop remote applications that use the SharePoint 2010 client object model if you are developing them on a SharePoint development server. If you are developing on a non-SharePoint server, you can copy the DLLs locally and reference them on your development computer. When you distribute your solution to users, you must ensure that the DLLs are included with your application. The easiest way to do this is to create a setup project by using Visual Studio 2010. When you develop .NET Framework applications, you can choose between synchronous and asynchronous execution of your commands. That is, you can call either the ExecuteQuery method or ExecuteQueryAsync method, depending on the requirements of your solution. These DLLs are located in the following path. These DLLs are built specifically for Silverlight applications—you cannot use the DLLs in the ISAPI folder in Silverlight projects. When you build your Silverlight solution, the DLLs are automatically included in the solution's XAP file so that you do not need to distribute them separately. When you develop Silverlight applications, you can choose between synchronous and asynchronous execution of your commands. That is, you can call either the ExecuteQuery method or ExecuteQueryAsync method, depending on the requirements of your solution. However, if you are executing commands on the main UI thread, synchronous calls are not allowed—you must use the asynchronous pattern. SharePoint Online provides new user interface elements that information workers can use to perform their tasks efficiently. For example, information workers can use the context-sensitive Server ribbon to access operations when they need to, and they can use the new dialog boxes provided by the client-side dialog box platform to interact effectively with SharePoint data and objects. As a developer, you can create ribbon controls for the Server ribbon and you can create dialog boxes for the client-side dialog box platform so that information workers can interact with your solutions easily. SharePoint menu items and ribbon controls are implemented as objects known as custom actions. Custom actions are defined as elements in XML files, and you can create them by using Visual Studio 2010. Menu items are custom actions incorporated into the built-in SharePoint 2010 user interface. As examples, the Site Actions menu is composed from several built-in, context-sensitive actions that appear as menu item links; and the Site Settings page includes links that are defined by built-in actions. You can build your own custom actions by creating XML definitions in element files in Visual Studio projects. And you can specify where they appear, such as on the Site Settings menu or on a specific administration page. Ribbon controls are also actions that appear on the SharePoint 2010Server ribbon. Like menus, the ribbon is context-sensitive and shows appropriate actions to users when users need them. For example, when a user browses to a document library, the ribbon controls for adding new folders and documents are shown. SharePoint 2010 includes many ribbon controls, and groups them together into related actions. For example, the New Document, New Folder, and Upload Document ribbon controls are grouped together on the ribbon. You can build your own context-sensitive ribbon controls, and you can specify a context in which to show them and a group in which to display them. Like menu items, ribbon controls are custom actions defined in XML element files. As with custom menu items, you develop ribbon controls by creating a new element based on the SharePoint 2010 Empty Element project item template, and then you add elements to describe the appearance and behavior of the ribbon control. Furthermore, common scenarios for ribbon and menu items include showing client-side dialog boxes that enable users to interact with SharePoint data. Typically, it is the dialog boxes that contain SharePoint 2010 client object model code for interacting with SharePoint, so the custom actions are often just a way to start the interaction, and may not need to include SharePoint 2010 client object model code. SharePoint Online provides a new client-side dialog box platform that enables information workers to work with SharePoint objects and data efficiently. You can create your own dialog boxes that enable information workers to interact with your solutions by using Visual Studio 2010. Many operations in SharePoint 2010 sites are now performed by built-in client-side dialog boxes. For example, the New and Edit forms for list data are rendered as modal client-side dialog boxes with an HTML interface. Client dialog boxes run in the user's browser, so the operations a user performs are responsive. Also, these operations do not place heavy loads on the SharePoint web servers. When you are deploying server-side code as part of a sandboxed solution (such as in a Web Part or event receiver), you do not normally have to consider how users are authenticated by SharePoint Online. Users will already have logged on to your site collection by using their Windows Live IDs, and your server-side code automatically runs in the context of the logged-on user. However, if your solution uses the client object model, then you may need to consider how authentication works in SharePoint Online, and how to interact with the authentication provider in your code. SharePoint Online supports only the Windows Live ID authentication provider. Given that there are three different implementations of the client object model, and given that they can be used in various scenarios, you must understand when you might need to interact with the authentication provider in your code. The following scenarios outline these details. In this scenario, as long as the Silverlight XAP file is served from the SharePoint Online domain (for example, www.contoso.com) or site, the client object model will use the same authentication cookies from the browser session. Therefore, you normally do not have to consider how users are authenticated by SharePoint Online for the operations that are performed through the Silverlight implementation of the client object model. In this scenario, your .NET Framework code does not automatically get authenticated. Therefore, you need to provide a mechanism for the user to log in to SharePoint Online so that you can then use the authentication cookie with your ClientContext object. First, be aware that the user must log on interactively, so you have to include a WebBrowser control in your .NET Framework application (such as in a Windows Forms or WPF user interface), and have the user employ that control to log on to SharePoint Online. When they are authenticated, the WebBrowser control will have received the authentication cookie supplied by SharePoint Online. However, these cookies are marked as HTTPOnly, and therefore cannot be accessed directly by your .NET Framework code. Instead, you must make a call to the WININET.DLL. The .NET Framework can call COM-based DLL methods through P/Invoke, and the method that you need to call is InternetGetCookieEx. This can return regular cookies and those with the HTTPOnly flag. When you have retrieved the cookie, you can take the same approach as in Silverlight applications for adding it to the ClientContext object’s request. SharePoint Online web services are a subset of the SharePoint Foundation web services APIs. These APIs provide methods that enable you to access SharePoint Online data from Windows applications, custom applications, and other instances of SharePoint. In SharePoint Online applications, you must use the Data Form Web Part to connect to any web service. Whenever possible, we recommend that you use the new client-side object model to work remotely with SharePoint Foundation data, instead of using the legacy ASP.NET web services. The following table lists each of the web services that are available in SharePoint Online, its path, and a description for the web service. Provides methods for working with alerts for list items in a SharePoint Online site. Copying items between locations in the SharePoint environment. Adding files to a distribution list. Copying files from one distribution list to another. Downloading files from a distribution list. Provides methods for managing Document Workspace sites and the data that they contain. The FindDwsDoc method of the Document Workspace service is not available in SharePoint Online. The AddDiscussionBoardItem method of Lists web service is not available in SharePoint Online. Provides methods for remotely performing searches within a SharePoint Online deployment. The CustomizeCss method of a Webs web service is not available in SharePoint Online. Provides methods to work remotely with the publishing service. For more information about Web Services in SharePoint Online, see SharePoint 2010 Web Services. If you are developing sandboxed solutions that will be deployed to SharePoint Online, you will need to set up your local environment so that you can develop, test, and debug your solution before it is uploaded to the solution gallery in your SharePoint Online site collection. You cannot deploy solutions directly from Visual Studio to SharePoint Online, and you cannot attach the Visual Studio 2010 debugger to solutions that are deployed in SharePoint Online, so you must attempt to mirror the SharePoint Online environment as closely as possible in your local environment. After you install SharePoint Foundation on your development computer, you must ensure that the Sandboxed Code Service is running. On the Start menu, click All Programs, click Microsoft SharePoint 2010 Products, and then click SharePoint 2010 Central Administration. In the System Settings section, click Manage services on server. In the list, next to the Microsoft SharePoint Foundation Sandboxed Code Service item, verify that the service is started, or click Start to start the service. After you complete these steps, you can develop, test, and debug sandboxed solutions easily in your local environment. Then, when your solutions are stable, you can package them into .wsp files and upload and activate them in the solution gallery in your SharePoint Online site collections. However, we recommend that before you deploy your solutions to a production site collection in SharePoint Online you should perform final verification of their usability in a site collection in SharePoint Online that mirrors your production site collections, but which is not used by your information workers. This approach will enable you to perform final tests and verifications for your solutions before you deploy them to the production site collections. SharePoint Online provides a business collaboration platform on which you can build solutions to meet your business requirements. Depending on the functionality and degree of customizations that you require, this Developer Guide shows how you can use a variety of approaches. These approaches range from making browser-based customizations, to modifying and extending your site collections by using SharePoint Designer 2010, to deploying custom sandboxed solutions that you create by using Visual Studio 2010.